Set against the real history of Nashville’s Belle Meade Plantation and the original Fisk University Jubilee Singers ensemble, To Wager Her Heart is a stirring love story about seeking justice and restoring honor at a time in American history when both were tenuous and hard-won. 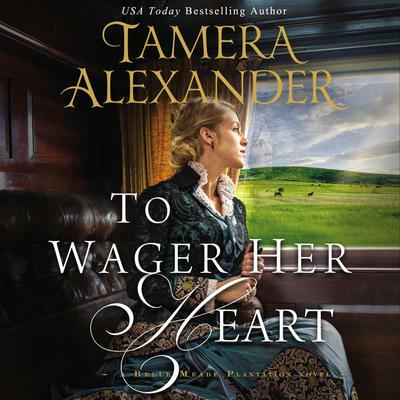 With fates bound by a shared tragedy, a reformed gambler from the Colorado Territory and a Southern Belle bent on breaking free from society’s expectations must work together to achieve their dreams—provided the truth doesn’t tear them apart first. Sylas Rutledge, new owner of the Northeast Line Railroad, invests everything he has into this new venture, partly for the sake of the challenge. But mostly to clear his father’s name. One man holds the key to Sy’s success—General William Giles Harding of Nashville’s Belle Meade Plantation. But Harding is champagne and thoroughbreds, and Sy Rutledge is beer and bullocks. Sy needs someone to help him maneuver through Nashville’s society, and when he meets Alexandra Jamison, he quickly decides he’s found his tutor. But he soon discovers that the very train accident his father is blamed for causing is what killed Alexandra’s fiancé and shattered her world. Spurning an arranged marriage by her father, Alexandra instead pursues her passion for teaching at Fisk University, the first freedmen’s university in the United States. But family—and Nashville society—do not approve, and she soon finds herself cast out from both. Through connections with the Harding family, Alexandra and Sy become unlikely allies. And despite first impressions, Alexandra gradually finds herself coming to respect and even care for this man. But how can she, when her heart is still spoken for? Sy is willing to risk everything to win over the woman he loves. What he doesn’t count on is having to wager her heart to do it.